Do You Want to "Hear the Changes?" Do you have trouble hearing chord changes? Would you also like to understand how these changes function in a key center so that you can improvise over them? Search no further - this course is exactly what you need. We call "Hearing Chord Progressions" a dual course because it develops the ability to hear tertial based chord changes while simultaneously improving instrumental technique. This course is the first in its kind in that it applies the Bruce Arnold System of Ear Training to hearing changes within a key center. It also takes the 13 most used tertial chord types through all possible cycles and the 96 possible permutations these chords. While not all students will need to work through all of these exercises I recommend at least sight reading through all études if you already have the ability to "hear" a specific exercise. There are many "Addendum" files with this course targeted for students who need further help. Although this course deals with 7th chords keep in mind that it's basic task is the teach you how to hear chord progressions within type of music regardless of style. The most important thing you will get from this course is an understanding of "how to hear music." You can then apply it to anything from Classical Music to Jazz. How Does This Course Differ From Fanatic's Guide to Ear Training and Sight Reading? You shouldn't stop working with Fanatic's Guide it has many great exercises but by adding a few exercises from The "Hearing Chord Progressions you can see the bigger picture of how all the exercises you are doing with Bruce Arnold's Ear Training System fit together. Hearing Chord Progressions is really teaching you how all the ear training products in the Bruce Arnold System fits into hearing harmony. It gives you the bigger picture and will work hand in hand with the other ear training you are doing with Bruce's system. Through the use of the Tuba MetroDrone you will improve your key retention something you will REALLY need when you move into "Key Note Recognition" or "Two Note Ear Training." MP3's and Midifiles for all exercises. I been working on various parts of this course with Mr. Arnold through Skype lessons so I kind of knew what to expect but I have to say , this is huge not just in size, but in value. I'm seeing results already. H. Thomson. 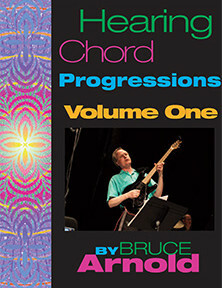 I've been searching for years to 1. understand chord progressions and 2. how to hear chord progressions better. Thanks Bruce, this is just great! D. Washington.